In this condition, there is an absence of the Cerebral Hemispheres, is incompatible with life. The absent Brain is sometimes replaced by malformed cystic neural tissue, which may be exposed or covered with skin. Varying portions of the Brain Stem and Spinal Cord may be missing or malformed. No diagnostic or therapeutic efforts are helpful, and these newborns either are stillborn or die within days or weeks. The Cerebral Hemispheres may be large, small, or asymmetric; the gyri may be absent, unusually large, or multiple and small. In some cases microscopic sections of the Brain biopsies may show disorganization of the normal laminar neuronal arrangement in what otherwise appears to be a normal Brain. Microcephaly (decreased head size) is often associated with these defects as well as moderate to severe motor and mental retardation. Anticonvulsants are often needed to control seizures. Long term supportive efforts are aimed at maximizing the capabilities of each affected individual. This condition is identified by a protrusion of nervous tissue and meninges through a Skull defect, is associated with incomplete closure of the Cranial Vault ("Cranium Bifidum"). Encephaloceles usually occur in the midline and protrude from the Occiput or into the nasal passages but can be present asymmetrically in the Frontal or Parietal regions. Small Encephaloceles may resemble Cephalhematomas (blood accumulation or "clot" beneath the scalp in a newborn), but x-rays show a bony skull defect at their base. Most Encephaloceles should be repaired. Even large ones sometimes contain mostly heterotopic nervous tissue, which can be removed without leaving major functional disability. When other serious malformations coexist, the decision to repair may be more difficult. The Hydrocephalus often associated with Encephalocele requires definition by CT or ultrasound and, if it is progressive, surgical treatment with a shunt. About 50% of affected infants have other congenital defects. The prognosis is good for many of these patients. Figure 1: Occipital Encephalocele in a newborn infant. 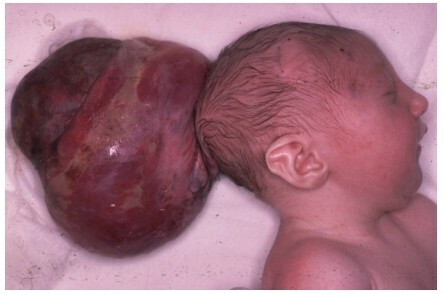 In spite of the appearance of this lesion, it can be excised with limited risk to the child. This is a cyst or cavity in a Cerebral Hemisphere that communicates with a Ventricle, may occur pre- or post-natally. The defect may be caused by a developmental anomaly, inflammatory disease, or a vascular accident, such as intraventricular hemorrhage with extension into the Brain substance. The neurological examination is usually abnormal. Diagnosis is confirmed by CT or ultrasound. Progressive Hydrocephalus may require a shunt procedure. While prognosis is variable; a few patients develop only minor neurological signs and have normal intelligence. This is an extreme form of Porencephaly in which the Cerebral Hemispheres are almost totally absent. Usually, the Cerebellum and Brain Stem are formed normally and the Basal Ganglia are intact. The meninges, bones, and skin over the Cranial Vault are normal. Results of neonatal neurological examination are usually abnormal, but findings are subtle. The infant fails to develop normally. Externally, the head appears normal, but when transilluminated, light shines completely through. CT or ultrasound confirms the diagnosis. Treatment is supportive, with shunting if head growth is excessive.